Melody & Mist: Portrait Dame Mit Hut (Lady With Hat) By ~ Anton Einsle. ~ 1801 - 1871. Vintage Ladies dressed in the Colour of Summer rain. Marquise de Caumont By Francois Hubert Drouais ~ 1727 - 1775. "Ballerina". By ~ Herbert James Draper ~ 1854 - 1920. Portrait Dame Mit Hut (Lady With Hat) By ~ Anton Einsle. ~ 1801 - 1871. Woman With Swans ~ By ~ T.C.Chiu. "Elegant Lady" By Charles Amable Lenoir ~ 1860 - 1926. "Portrait Of A Lady In White" By ~ Louis Lie Perin-Salbreux ~ 1753 - 1817. "The Jade Necklace", By ~ William Clarke Wontner ~ 1857 - 1930. Springtime, By ~ Marty Bell ~ 1931 - 2003. "A Fair Beauty,Lily", By ~ Herbert Schmalz ~ 1856 - 1935. Anton Einsle (1801 Vienna - 1871 ibidem) was a very significant Austrian portrait painter of the 19th century. At the age of 13 he began studying at the Vienna Academy and painted his first works on commission at 16. His first portraits in oil and miniatures are known to appear in 1827. His works were represented at all great exhibitions in Vienna from 1830 on. Einsle worked in Prague and Budapest for a few years. He soon became a favourite portrait painter of high aristocracy and royals and was an official portraitist of Kaiser Franz Josef I. Works by Einsle are represented in many museums in Austria and abroad. Labels: Anton Einsle ~1801 - 1871 ~ Lady With Hat. "Grazieuse", By ~ Angelo Asti ~ 1807 -1903. "Girl With Flute" ~ Porcelain Plaque ~ 1900's. Adelaide salles- Wagner ~ 1825 - 1890. ~ Young Woman With Lace Shawl. Adrien Moreau ~ 1843 - 1906. ~ Beneath The Cherry Blossoms. Albert Edelfelt ~ 1854 - 1905. ~ Portrait Of A Lady. Albert Ernest Carrier-Belleuse ~ 1824 - 1887.Sculpture. Albert Lynch ~ Elegant ~ 1851 - 1912. Alfred Chantrey Corbould ~ 1852 - 1920. ~ A Girl Reading In A Sailing Boat. Anatole Vely ~ 1838 - 1882. ~ La Meditation. Angelo Asti ~ 1807 - 1903. ~ Grazieuse. Anna Katrina Zinkeisen ~ 1901 - 1976. ~ The Dark Lady. Anthony Frederick Augustus Sandys ~ 1832 - 1904. ~ Grace Rose. 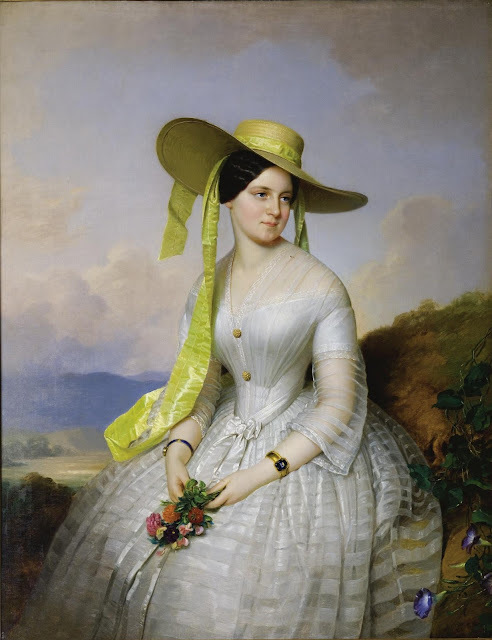 Anton Einsle ~1801 - 1871 ~ Lady With Hat. Anton Raphael Mengs ~ 1728 - 1779. Pleasure. Arlene Dahl ~ 1928 - 1950's. Actress. Armand Point ~ 1860 - 1932. ~ Colour Thy Soul. Arthur Hughes ~ 1832 - 1915. ~ Forget Me Not. Ball Gown ~ 1858 ~ Boston. Betty Maude Christian Fagan 1861 ~ Young Lady In A Garden. Carolus Duran ~ 1838 - 1917.Mademoiselle de Lancey. Charles Amable Lenoir ~ 1860 - 1926 ~ Elegant Lady. Cleto Lozzi ~ 1884 - 1952. ~ The Admirer. Dante Gabriel Rossetti ~ 1828 - 1882. ~ Bocca Baciata (The Kissed Mouth. Edmund Blair Leighton ~ 1853 -1922. Where There's A Will. Elisabeth Sonrel ~ 1874 - 1953. ~ Soiree de Mai. Elisabeth Vigee Le Brun ~ 1755 - 1842. ~ La baronne de Crussol. Ellen Day Hale ~ 1855 - 1940 ~ The Green Calash. Emile Auguste Pinchart ~ 1842 - 1924. ~ Autumn Fantasy. Etienne Adolphe Piot ~ 1850 - 1910. Fernand Toussaint ~ 1873 -1955 ~ The White Rose. Francois Boucher ` 1703 - 1770. ~ Jeune Fille. Francois Boucher ~ 1703 - 1770 ~ The Interrupted Sleep. Frans Verhas ~ 1827 - 1897.~ The New Bracelet. Franz Xaver Winterhalter ~ 1805 1873. Friederich von Amerling ~ 1803 - 1887. Girl With Straw Hat. Girl With Flute ~ Porcelain Plaque ~ 1900's. Gustave de Jonghe ~ 1829 - 1893. ~ Look At The Time. Henry John Yeend King ~ 1855 - 1924. ~ Gathering Spring Flowers. Henry Thomas Schafer ~ 1873 - 1915. Herbert James Draper ~ 1854 - 1920. ~ Ballerina. I Wish I Could.... Quote. James Sant ~ 1820 - 1916 ~ A Thorn Admidst Roses. Jean Laurent Mosnier ~ 1743 - 1808.~ Elisabeth Alexeievna. Jean-Francois Raffaelli ~ 1867 - 1924. ~ The Maid Of Honer. Jens Juel ~ 1745 - 1802. ~ Portrait Of A Lady. John Atkinson Grimshaw ~ 1836 - 1893 ~ Good Council. John Henry Frederick Bacon ~ 1868 - 1914 ~ Lady With Roses. John Simmons ~ 1823 - 1976 ~ Girl Holding A Lily. Jozsef Molnar ~ 1821 - 1899. ~ He Loves Me. Jules Charles Aviat ~ 1844 - 1931. ~ Lady Holding A fan. Jules Toulot ~ 1863 ~ Elegante au Chapeau. Konstantin Andreevic Somov ~ 1869 - 1939 ~ Fireworks. Louis Lie Perin-Salbreux ~ 1753 - 1817. ~ Portrait Of A Lady In White. Luke Fildes ~ 1843 - 1927. ~ Gathering Flowers. Marcus Stone ~ 1840 - 1921. ~ Winter Berries. Marcus Stone ~ 1840 - 1921. ~ Lovers Embracing By The Moon. Marquise de Caumont ~ Francois Hubert Drouais ~ 1727 - 1775. Marty Bell ~ 1931 - 2003. Norman Prescott-Davies ~ 1815 - 1910. Philip Hermogenes ~ 1833 _ 1898. Philip Richard Morris ~ 1838 - 1902. ~ Varens. Porcelain Portrait ~ By Freeman. Renaissance style porcelain portrait of a girl. Rene Guerin ~ 1862 - 1895 ~ Summer. Samuel Luke Fields ~ 1843 - 1927 ~ The Love Letter. Sir Edward John Poynter ~ 1836 - 1919 ~ On The Terrace. Sir James Jebusa Shannon ~ 1862 - 1923. ~ Violet. Sir Samuel Luke Fildes ~ 1844 - 1927. ~ Sophia. Stephen Reid ~ 1873 - 1948. ~ Waiting In The Garden. Theodore Levigne ~ 1848 - 1912 ~ The Courtship. Tito Conti ~ 1842 - 1924 ~ Agreeable Tidings. Vittorio Matteo Corcos - 1892 - 1933. Vittorio Matteo Corcos ~ 1859 - 1933. ~ Contessa Nerina Pisani. Vladislav Chahursky ~ 1850 - 1911. ~ The Letter. William Bouguereau ~ 1825 - 1905. ~ Innocence. William Clarke Wontner ~ 1857 - 1930. ~ The Jade Necklace. William Henry Margetson ~ 1861 - 1940.~ The Sea Hath It's Pearls.